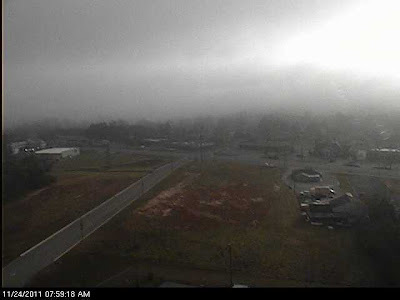 Cookeville is shrouded in fog this morning at 8 am CDT on Thanksgiving 2011. I do expect skies to become sunny as the fog burns off in the next hour or two. Daytime highs will be in the low 60's with a mainly calm wind peaking at 5 mph later in the day. Thanksgiving 2011 night will be clear and cold with lows in the mid 30's by sunrise on Friday. I'll have the forecast for the Black Friday shoppers in the next paragraph. For those early black Friday shoppers, expect the 11 pm temperature to be around 44°. If you're going to one of the 3 am store openings, expect the temperature to be right around 39°. Finally, the just before sunrise temperature will be around 36° (in the 6:00 am range). You'll notice a quick warm-up on Friday with temperatures rising through the 40's in the morning by 9 am and through the 50's by noon. Our high should hit 65° by later in the afternoon. Tennessee Tech hosts Central Arkansas on Saturday at 2 pm at Tucker Stadium on the campus of TTU in the first-round of the FCS (formerly known as 1-AA) playoffs. I do expect the rain to hold off for the ballgame and for us to have a very nice day at kickoff with a temperature in the middle 60's. Bring a jacket as it will be windy with gusts to 25 mph and sustained winds around 12 to 17 mph. GO TECH!!! !